Last night, after applying for and receiving my ABN, and initiating the process to register my business name, sending the appropriate paperwork to my boss to acknowledge and seek approval for secondary employment, and joining a few other online business tools, I ordered some stationery. Working out exactly how I will run the first course is tiring work. I have bought some books on writing as therapy and have commenced reading them. I have decided to trial a six week course, or three half day weekend workshops next year. Each participant will receive a journal and pen, and obviously, my expertise and support. And that’s as far as I have gone. I googled the application process for University of Wollongong Doctor of Creative Arts and Doctor of Philisophy in Creative Arts. The latter is more likely to permit me access. But they also might not. I have started to formulate a focus – creative non-fiction/the therapeutic value of Life Writing – you get the gist. Early stages. I woke up this morning absolutely exhausted. Life change and taking control to force change is tiring lol. I dreamed last night. Vivid dreams about work and about starting the term as Head Teacher Mathematics until another staff member gets back from leave. The Maths Faculty will walk in on Tuesday to find me there. And unbelievably, I am nervous. Twenty seconds of courage. 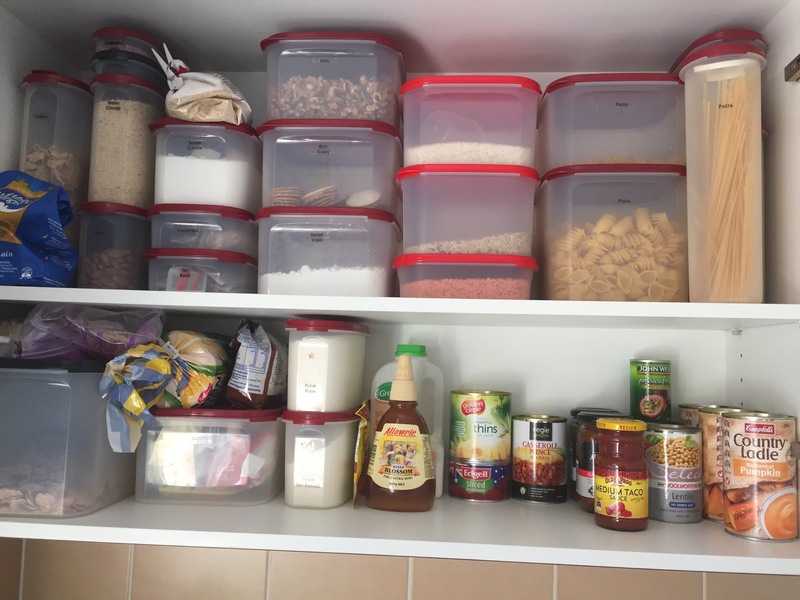 I will go in this week to sort my stuff out so that I am prepared, as well as I can be. And so I woke several times throughout the night and my eyes were so tired this morning. I fell asleep on the lounge for five hours. I woke at 1:30 this afternoon and my pets were also napping – a happy home lol. I need to finish my fostering application tonight. Ready to send it tomorrow morning. Then I need to finish sorting the house out, write two units of work, and complete some assignments in my Children’s Writing Course. The next one is almost done. My head and heart are stronger. It has taken time. But not as long as it could have. This time I need to ensure my boundaries and prioritise myself. I have decided to grab my life by the horns and really start to live it again, like I did when I was young. I’m shaking my snow globe and daring the flakes to settle in new patterns. Today was my initial business consultation. It went exceptionally well. 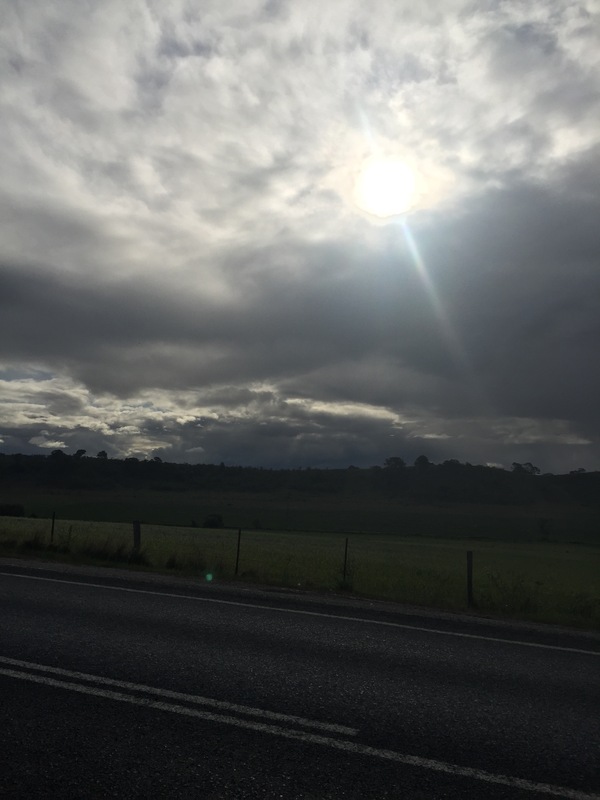 I have an action plan to follow, starting with applying for an ABN and then registering my business name (and trademarking it so that it can act as an asset – yep, I learned heaps). I looked up their Post Graduate courses. They offer a Doctor of Philosophy (Creative Arts) and a Doctor of Creative Arts. I have read the requirements; I am not sure that I meet them. But, twenty seconds of courage, and I have enquired. I am going to apply. It doesn’t cost anything except courage. I am going to focus on the therapeutic value of creative writing/life writing. This connects to the first phase of my business plan. The first phase of my business plan also then provides research participants for my research. Add to that my foster care application. And I am making dreams come true in every direction. That’s the way to go … Following my bliss. I just started to watch tonight’s episode of Australian Story, recorded because I wasn’t sure I would be able to sit through the whole thing in one sitting, and I was right. The urge to be a mother can be so primal. I was forced to think of the entirety of my journey to motherhood thus far, including the life choices I made to be in the position of needing to use fertility treatments. The most incredible part is that desire, deep seated longing, to become a mum. I cry it is so fierce. I know that my best chance of being a mum for a young child all the way through is through foster care. I am okay with that. Now. But I really feel like I need to let other people know how hard it is emotionally to see other people with their own children; a constant reminder that as a woman I was inadequate. A failure. And before you jump telling me that I’m not a failure and far from inadequate, I need you to hear what I’m saying. Logically I know that I’m not too. But that means nothing. Or very little. At the end of the day, you have had what I don’t. I am working to change that. And at some point, my home will be filled with children. I’m at peace with my path. But it still hurts. That yearning unfulfilled … Cries. What an incredibly contentious issue at the moment. One of my very good friends shared a response to a column written by Miranda Devine in one of our tabloids. Everyone has an opinion. Myself included. But all of our opinions are based on our contexts. There can be no right or wrong, just different shades of a complex and huge issue. I witnessed extreme domestic violence growing up between my parents. Contrary to popular perspective, we were far from poor and my parents are both highly intelligent people. It has only been as an adult that I have been able to understand why my childhood was what it was, and only through understanding the context of both of my parents. Their contexts are their stories so I won’t divulge their confidences here. Suffice it to say that the domestic violence in my home occurred because my parents had failed to communicate and were both unhappy, feeling trapped by the responsibilities of adulthood. Beyond poverty and poor education, I think the greatest cause of domestic violence is unhappiness which leads to disconnection. This results, in some cases, in excessive alcohol and drug consumption leading to violence. In other cases people just feel trapped and angry, and rather than seek help they become violent. For other people, they saw violence modelled and don’t know another way. And then there are those that feel powerless in their own life so exact power over others. Ultimately though, the causes go well beyond poverty and/or poor education. Are some areas and socio-economic groups more prone? I’m not sure. Definitely more prone to reporting it, to calling police, to being vocal. I think in more affluent areas domestic violence is easier to hide and more important to hide. I was engaged in an unhealthy relationship when I was younger. Understanding the context of both of us, I now understand why it happened. I have since broken that cycle. But I had to break the cycle. As a child I did not have healthy and respectful relationships modelled for me. I only knew dysfunction, violence and abuse. That has been my cross to bear as an adult. I think the money that the government wants to spend should be spent on support services for victims, both male and female, and even more importantly, the children. I think to break the cycle we need to teach the children. We need to ensure that all kids are armed with knowledge to know that there are better and healthier ways of connecting. That there are support services in mental health plentiful enough for everyone. That everyone feels connected and valued. That everyone fulfills a purpose. But how do we achieve that in a country where elected leaders engage in a type of dysfunction at the highest level of government; letting their own egos and lust for power control their actions? Yep, no healthy modelling there. The seasons are a metaphor for life. 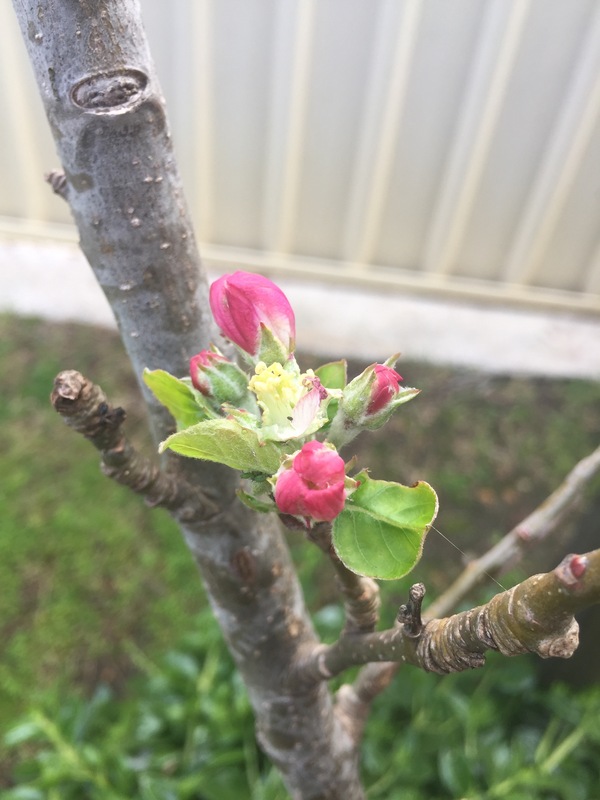 Spring – new life, hope, promise, potential, growth. For me, especially during life’s darker times, I have found it helpful to break time down into chunks. Every new year, every season, every month, week, day, even hour, is a new opportunity. And within that moment or chunk of time, lies hope and promise. Whilst we can’t control everything, we shouldn’t lose sight of what we can control. We control our responses. And from that, we control our moments. And it is easier to know this, when we are happy and life is alright or good. It is more important for us to remember and realise it in our darker times. So many children and adults seem to be suffering from anxiety and depression, increasingly as the months roll on, and whilst there is less of a stigma, people still don’t know how to be there for others, and so it becomes the burden of each person to heal themselves. And this isn’t easy to do when the mere thought of getting out of bed seems insurmountable. Focusing time into chunks has always helped me. Immersing myself in nature is grounding. Practicing gratitude and meditation helps my brain find the path back to balance. And making time just for me is vital. This last part I have struggled with this time. But I am building to it. And I will somehow resolve the guilt that it inevitably brings. But I need to do it. I need to be strong again through balance when I go back to work. It will be a hard term, harder if I don’t start it well within myself. I am putting shelves up in the laundry to be able to sort out the spare room. Cleaning out the garage and storage in the laundry will enable this. 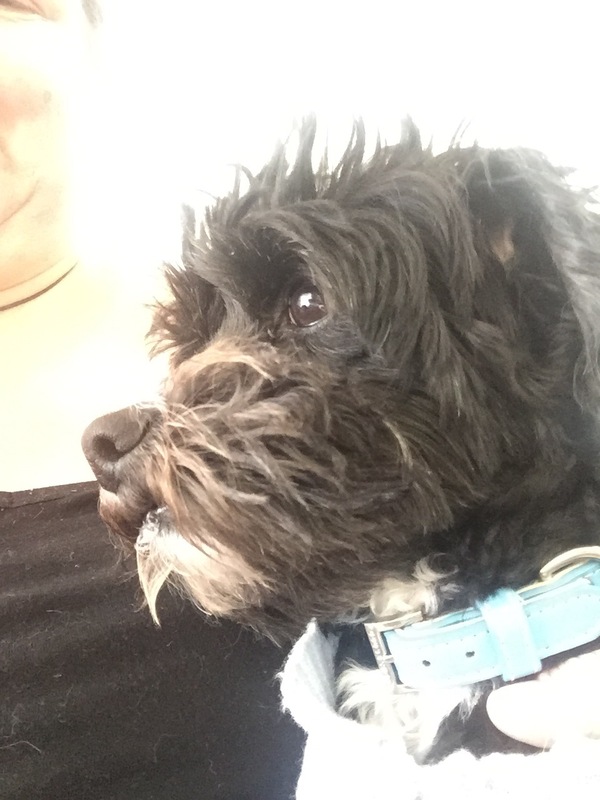 I was sitting in the spare room not long ago, and I started to think about where a bed might go, hoping that my fostering application will be approved. The room needs some life, an inhabitant, to bring it into this home. I am really excited about the potential of that, of a family growing in this home, beyond my fur family. I can imagine a child playing, a child healing, a child knowing and believing that their darkest days are behind them. Here, they will grow, they will heal, and I will grow. I don’t expect it will be easy. Not at all. But eventually there will be more happy than sad, even if it’s only by a little. A very tired and migrainey Tina so this will be quick. I was helping out some lovely ladies today who are raising money for the Cancer Council. I woke with a migraine twinge and took drugs so that I could function through the day. I lasted until 3 before it took over. A fairly good innings. Came home and went for a shower. As I let the hot water beat on the back of my neck I was overcome by a ‘vision’. I was wearing my NYC uniform (black dress with black Skechers) and I was in a smallish room. My reiki table was set up on one side and there were two very comfortable armchairs on the other side. I was in abou selling session and we were forward planning a weekly goal for my client. I was so happy. So relaxed. So calm. So in my element. And thus my business plan has started taking form. One of my long term goals is to start my own business. It’s been on my mind a lot lately. And today I just decided to do something about it. I have organised a consultation with a small business expert. I’m pretty darn impressed with myself. I figured the only thing stopping me from moving forward in my life is me. And if that’s my main obstacle, well, I can control that one. And so I did. I’m not sure where it will take me, if anywhere. But I’m happy that I’ll be armed with relevant information and won’t unwittingly break the law. Further to that, it’s almost time for me to start writing again. My hiatus has been positive in the sense that my creativity has been flooded with story ideas. When I’m not writing I feel like a significant part of myself is lost to me. I hate that. Time to change that. See what I did there. And just as an update, I had my doctor’s appointment this morning for him to fill out my medical reference for my foster care application. I will mail that on Monday. And I spent this afternoon baking. 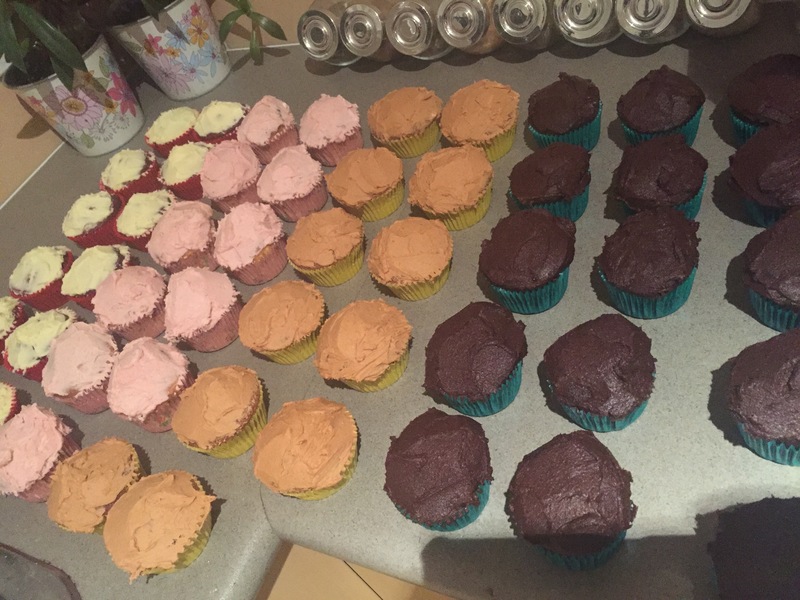 Fifty three cupcakes later … I’m a bit tired. I love baking though. It was the picture for my fourth day of a hundred happy days. Plain, red velvet, caramel and GF chocolate. I may have stuffed the caramel ones though by using milk instead of water. I need a taste tester. Lol. The absolute unconditional love of my dog and his unwavering loyalty make me blissfully happy. Where would we be without our pets. This morning he was galloping around his sister (long suffering Molly the cat), and trying to coax her to play by showing her how he can shake and throw his bed around. Needless to say she bristled and hissed, and Max kept trying anyhow. These moments are truly happy. And then I moved the contents of two of the cupboards in my kitchen; back to my Sleeping with the Enemy days. That sense of achievement as things are crossed off my to do list. I cleaned the garage out today. I have thrown out a lot of paper and a fair bit of junk. Ruthlessly. I have sorted out what is going into a friend’s garage sale to raise money for the Cancer Council and have the first load in the car. When I was cleaning out to move, I wasn’t as ruthless. My home is small. Cleaning out now is in preparation for becoming a foster mum (praying fervently that I will be approved) and so I am really cleaning out. And I haven’t even started on the spare room (hopefully a future child or children’s room). The feeling of fulfilment though, from something that took all day and isn’t completely finished, is amazing. Every day I decide to be happy and fulfilled, and thus far, the desire is enough to make it reality. And for that, I am grateful. 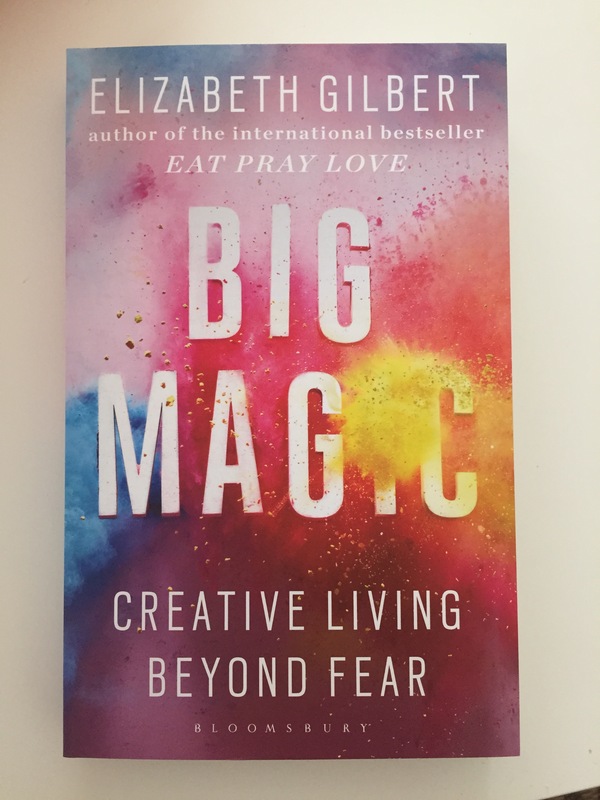 Today – Big Magic arrived in the post – woo hoo! 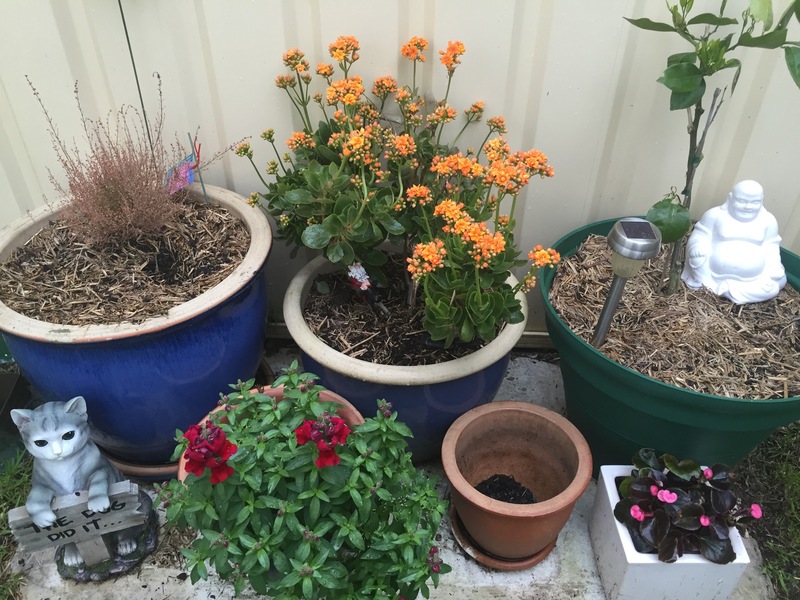 Yesterday – my flowering plants – I love gardening/creating and need to make more time for it. I just registered for the above challenge. A photo a day of something that makes me happy. I figure this will keep me on track. I think everybody I know should register for this; how happy a group will we all be by the end of this year, and what a difference to the world we will be making. As well as to our own lives of course. It is almost a visual gratitude journal. Hashtags scare me. But I will learn how to use them.